Joanna Bosse is an associate professor of ethnomusicology and dance studies at Residential College in the Arts and Humanities at Michigan State University. 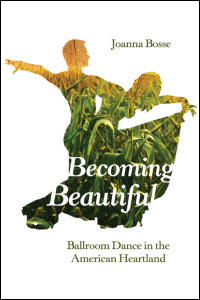 She answered some questions about her book Becoming Beautiful: Ballroom Dance in the American Heartland. In the book she explores the transformations undergone by the residents of a Midwestern town when they step out on the dance floor for the very first time. Q: What draws those with little dance experience into the world of ballroom? Joanna Bosse: I think many adults in the U.S. are seeking ways to be physical and creative. As a population, I think we are still struggling to find a way to do this organically: our work and family lives take over and we put our mental and physical health on the back burner. At some point, and for many of the ballroom dancers I worked with, they began to dance after a major transition in their family life. Either their kids moved away to college or they divorced or experienced the death of a spouse. This transition creates a space that needs to be filled and many turn to dance to find a better balance than in the life they had before. Ballroom is not the only avenue for this kind of thing, but it is particularly well-suited to this role. It was designed for adults with little dance experience and as such, the beginning “basic” steps require not much more than walking. Slowly one moves from essentially walking in time to dancing and the transition is almost seamless. The fear of taking risks and trying something new slowly erodes under the positive reinforcement that each dance experience can provide. It is powerful and meaningful. Q: Tell us a little about the Regent Ballroom in Savoy, Illinois, the venue your research centers around. Bosse: The Regent is a home away for home for so many people and the Regent “family” was so supportive of my research. David Lin is smart about what it takes to build a community and he has done it. He was an amazing teacher of dance (I have never seen better), but also of human psychology. We spent hours discussing the importance of making dancers feel safe so they could be freely expressive. I no longer live in the area and I miss dancing there a great deal. Q: What new perspectives did you gain by stepping into the role of ballroom performer? Bosse: As a trained musician, I was very interested in thinking about why certain music makes us want to move and in the cultural divide between classical and popular music traditions, and this was my intellectual point of entry to ballroom dance. I had never danced ballroom before and didn’t consider myself a “dancer” with all of the baggage about classical training that the name implies. But living for a number of years with a Texan, I was quite familiar with the country two-step. So I anticipated the amount of overlap that music and dance share. One thing that surprised me is the distance between them. Being a great musician does not set one up for being a great dancer. Perhaps more than anything else, performing ballroom was instructive in how closely connected our subjectivity is to our physicality. A change in movement really does cause a change in concept—the way we conceive of ourselves as well as the people around us. People change and relationships change in drastic ways; and usually for the better. This change was a surprise to me. In my research, I expected to focus on the theoretical intersections of music rhythm and dance rhythm but was presented with a different story instead and I felt compelled to explore it. Q: What is the “self-imaginary”? How does it relate to the idea of “becoming beautiful” through dance? Bosse: I developed the idea of the self-imaginary to name something that I had not found accounted for in the ethnographic literature on identity. Identity is a way to name the socially constructed and shared notions of who a person is. But most of the dancers I worked with were struggling against that publically negotiated identity. They felt they had potential to be more than a “computer nerd” or “housewife” or a “white, straight American middle-class male” but that oftentimes no one else knew. This belief in one’s human potential (the self-imaginary) and the process of realizing it through dance was important to me and I wanted to find a way to testify to its power in shaping American life. The dancers were so honest, willing to be vulnerable and share with me these intimate ideas about themselves and I wanted to be sure that it was captured in some way and, in the process convey to scholars across the disciplines something about what performance has to teach us. Q: You write ballroom dance is associated with predominantly white, upper-middle class communities, which are rarely the focus of ethnographic studies. What were some of your goals in studying this community through an ethnographic lens? Bosse: Initially I was not drawn to ethnomusicology for its focus on difference, but rather a desire to explain musical life here in the US. As such, from the very start I was compelled to bring white Americans into the center of ethnomusicological inquiry. In order for the ethnographic disciplines to continue to be relevant, I believe this kind of study needs to be commonplace. White Americans and the institutions they have created have been demonized throughout decades of ethnographic literature, and to be sure some of the major instances of violence known in the world have been perpetrated by some white Europeans and Americans. However, rhetorical demonization without deep knowledge will not stop the injustice and suffering caused by dominant groups. Without a true and humanized understanding of how elites move through the world, we cannot hope to create greater cultural tolerance, equity and peace. What struck me in my research was how vulnerable most of the dancers I worked with felt. While they represent one of the most powerful social groups in the US and the world, they nevertheless felt very insecure about a great many things. This contradiction struck me—it still does. It was also clear that it was the thing that drove many of them to dance. So the study provides an opportunity to consider how artistic practice can be viewed as a solution to a social problem.